Case managers working inside patient-centered medical homes and accountable care organizations are becoming bigger players in primary care. 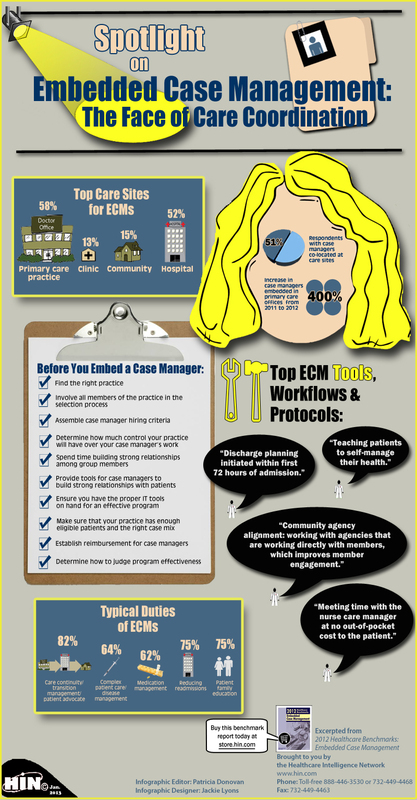 About half of healthcare organizations embed or co-locate case managers at points of care, according to new market research by HIN. 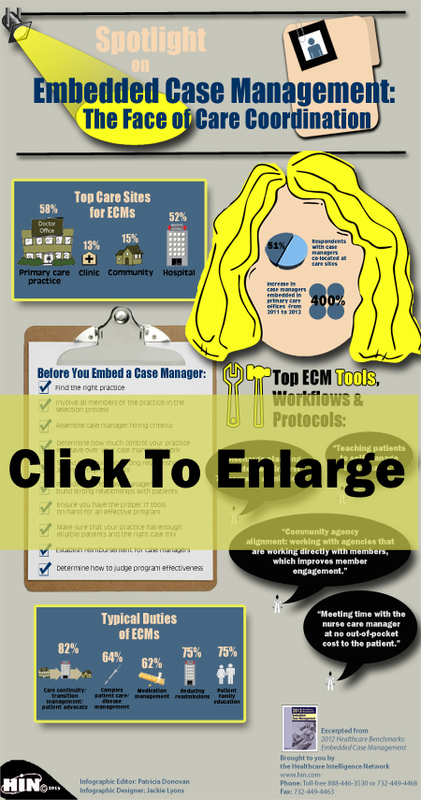 This infographic shows the top care sites, tools and typical duties for embedded case managers, a check list for before embedding a case manager and more. Listen to Annette Watson, senior vice president of community transformation for Taconic IPA (TIPA), describes TIPA’s requirements for the RN case managers it hires for its advanced patient-centered medical homes. 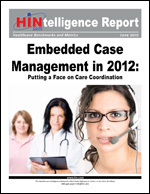 More information on this topic can be found in: 2012 Trends in Embedded Case Management: Putting a Face on Care Coordination . This executive summary examines the responses of companies who embed case managers, providing a high-level look at work locations, program components, and the greatest challenges and benefits of this case management strategy. Responses provided by 153 healthcare organizations revealed that case management presence at primary care sites had quadrupled in just the last 12 months, from 14 percent in 2011 to 58 percent this year.